I tweaked the diagram so it's easier to see Salt, Sulphur and Mercury on their corresponding pillars. Hopefully this makes it easier to see how each principle extends the full length of each pillar. This freed up some space in each sephira so they're less cluttered. I also removed my comments for Desire, Mind and Will. I thought less might be more in this case. Abrac , I have a couple of comments about the FRC ToL as you have shown it . In " The Tarot and the Rosy Cross " , Waite states regarding the Shekinah on the Tree : " On the threshold of BRIAH , at the Gate of the Second Order, in the Portal of the Rosy Cross ,she ( i.e. Shekinah ) appears as Temperance , the Keeper of the Middle Way". Therefore I believe, based on that, that the path from Yesod to Tiphareth belongs to Temperance and not to the Lovers . I think the Waite-Smith deck was created when Waite still used the GD attributions of the ToL, although the Waite-Trinick may have used different attributions. 1. Water at the foot of the angel suggests the Moon or Yesod. Sun at the head suggests Tiphareth. So the angel seems to span Path 25. 2. The angel can be thought of as straddling Sagittarius. One foot is on Water (suggesting Scorpio), the other on land (Capricorn, Earth). Waite's paper "The Tarot and the Rosy Cross" was undated but speculation is it's from c. 1910 [Darcy Kuntz], before he started writing FRC rituals. There's a link here to a PDF http://tarothermeneutics.com/classes...ick/Week2.html, see "The article entitled 'The Tarot and the Rosy Cross' from 1910." It reproduces Waite's paper and includes a footnote that say it's "Independent and Rectified Rite typescript" which would presumably place it during the IRR period. The placement of Temperance and the Lovers has been a problem for me. I've gone by the information in the rituals I'm in possession of. I'll explain how I reached the conclusions I did. "The symbol that lies uppermost on the Altar is that of the 27th path. It represents Shekinah as the Lady of Reconciliation and Lady of the Pillar of Benignity, intermingling and reconciling the influences of Chesed and Geburah, regarded as cleansing water and saving fire. They are poured forth from two Chalices, which have a meeting point at Yesod and descend thence as a river of life in Malkuth. In the ascent of the Tree this symbol signifies the will toward rebirth, being the last mystery unfolded by the Grades of the Rosy Cross at that point where the world of formation merges in the world that is beyond. In the descent of the influences from above it signifies the virtues and graces of the Pillars on the right and the left uniting with those that come down from the Middle Pillar, represented by Shekinah, who is herself the vesture of Messias. Her Chalice is a Chalice of salvation, a principle of sacramental life. Her Cup is the Cup of benedictions. It is an eternal Cup of mercy, uplifted in the worlds of the Tree. It is also a well of cleansing, even as the laver of Moses, and a deep water of illumination, like the sea of Solomon." Waite describes her as "Lady of the Pillar of Benignity" which definitely sounds like she should be on the central pillar, but she's shown to the candidate on path 27. It seems possible in this case her function is different from her actual placement on the paths. I made an illustration once upon a time in which I tried to picture how this might look. Her feet are standing on path 27th and she's reaching up to Geburah and Chesed. "Beneath the Banner of the Middle Path is a symbol representing marriage. You were told in the 4 = 7 Grade [Philosophus] that Shekinah is the feminine and Messias is the male aspect of the Divine in manifestation. The union of both must be attained in us, and it is this which you see before you, the wedlock of the soul and the Christ natures, under the wings of Shekinah. The ascent into Union by way of the Middle Pillar is the path to your own marriage. At the beginning it is like the upward breathing of a pure spirit, and the breath of the Spirit comes down. And till the great day of consummation the Spirit and the bride say, Come. The benign and gracious being who officiates at the Espousals before you is also a symbol of the Second Birth in spiritual consciousness. She presides over marriages and births. He who has attained to this state of regeneration in God shall draw, my Brother, all parts of his personality into the redemption of the higher nature. He shall raise up his fallen Sephiroth, including Malkuth." In this description Waite doesn't specifically say it's the 26th path, only that it's the "middle path." Elsewhere in the ritual it's made clear that Yesod-Tiphareth is path 26. "The Great Symbols of the Paths, displayed beneath their Banners, reveal to you that in the nature of things there was no other path of ascent open than that which you have followed, namely, the 26th Path." Note the word "ascent." The 26th path is vertical. And, "You stand now symbolically on the threshold of the 26th Path." This said to the candidate as he/she is in Yesod preparing to ascend. If you check the roman numerals at the bottoms of the Trinick Temperance and Lovers, which indicate their paths, the Lovers is 26 and Temperance is 27. "But we have told you already that Shekinah in our mystical allegory is the proclamator of unity and the guide of man therein. As the He final in Malkuth, she is in the state of separation or exile, and so also is the soul of man, apart from the Spouse of the soul. In the state of Union, which is the state of the Middle Pillar above Malkuth [Yesod], the He is in union with the Vau, as exhibited by the diagram before you and as represented, also traditionally, in Rabbinical Hebrew by the exclamation Vah, which expresses a state of joy. But this union, which begins in Yesod and is so symbolized therein, is perfected in Tiphereth, where the Lover and Beloved are no longer face to face, in simple union no longer, but in the condition that is called UNITAS, wherein there is no passage between subject and object, for all things that belong to love have been made one in the heart of love. This describes progressively higher states of union on the middle pillar. That of Tiphareth Waite has designated UNITAS. The Priest, in the Great Symbol for Daath, has UNITAS written on his mitre, but apparently this is a reference to Tiphareth. Again, this is based on the rituals I have. The authors of Abiding in the Sanctuary may be privy to other information. Very interesting to see how Waite's thoughts on the placement of Temperance and The Lovers seems to have evolved over time because you are right Abrac about the dating of the paper that I quoted from " The Tarot and the Rosy Cross " which according to R.A. Gilbert, Waite's biographer, dates from the latters Independent and Rectified Rite days sometime between 1906 and 1911. Richard's comment on the symbolism of the RWS Temperance is interesting also although the solar symbolism of Tiphareth can also be seen on the RWS Lovers card in which according to the PKT , " the sun shines in the zenith ' although the water attributed to Yesod is missing on this card. 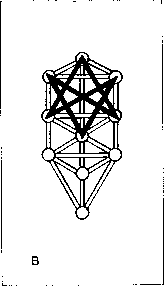 The Star (30th path, Netzach-Malkuth) is another example where the meaning Waite ascribes doesn't fit exactly with its placement on the tree. "The Symbol of the 30th path is an analogue of that which stands first in the present sequence. It is Shekinah again in the act of dispensing the powers and virtues from above. The Pillars of Mercy and Severity are represented by their Sephiroth in the form of stars. Tiphereth is immediately above and appears as a star of six points, by reference to the Christ nature. She herself bears upon her breast the star that corresponds to Yesod, and at her feet is Malkuth, whereon her urns of life are emptied. They are urns of Water and of Fire—the rain of Doctrine, the dew of Divine speech, the great Water of understanding; and the Fire of the Holy Spirit, the tongues of flame, the splendor of Supernal Wisdom." From the description and the symbolism on the image one could easily assume it too should be on the central pillar but it's obviously not. I'm reading A History of the Occult Tarot 1870 - 1970 (Decker, Dummett) and was pleasantly surprised to find more information on Waite's Tree of Life correspondences. The authors refer to a diagram shown to them by R. A. Gilbert which they claim Waite used in preparation for use in the FRC. They provide a table which shows some of the correspondences from the diagram. It appears to be an intermediate stage where Waite is working out his system. The paths all correspond to the Hebrew letters assigned to them in the GD, but their arrangement on the Tree is different from the GD; they follow the same arrangement as my diagram which I developed from the rituals. All the tarot correspondences follow the GD exactly despite the tree designs being different. For example, in the GD, path 11 is the Fool; in Waite's diagram, the Fool is also path 11, and so on down the line. From this it's very easy to know which of the Great Symbols go where since they're all numbered at the bottom, indicating their path. Waite's final arrangement of the Great Symbols on the paths is quite different from Decker and Dummett's table (GD arrangement). The table is pretty small, but rather than recreate it I enlarged and enhanced it a little to make it easier to read. Thanks for that kwaw. It's becoming more clear to me that Waite's use of Daath isn't that original; but what he appears to have done, which seems like an innovation, is utilize Daath as a Portal (to the Supernals). Rather than an unofficial sub-sephira—a symbol of the union of Binah and Chokmah—he made it a full-fledged sephira and path in its own right. Decker and Dummett aren't quite sure what to make of the Great Symbol numbered 0 (the High Priest, or Melchisedech). It's assigned a number like all the other paths because in Waite's mind it is a path (Daath). Abrac - can't find a pm link for you!? Is it OK if I share a link to your ToL diagram on a GD forum?